A well-balanced diet, regular exercise and a responsible pet ownership are essential to your dog’s overall well-being! Click the links below for nutritional wellness tips, homemade dog food and treat recipes, health articles and speciality diet tips! This section also has information on dog surgeries and rehabilitation, particularly hip, leg and pelvis injuries. 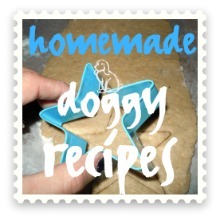 Find recipes to whip up homemade dog food in your own kitchen using human grade food. Recipes include specialty diets for dogs with wheat and skin allergies and diabetic dogs as well as simple rice dinners for when your dog has an upset stomach. Browse the recipes and start cooking for your pooch tonight! 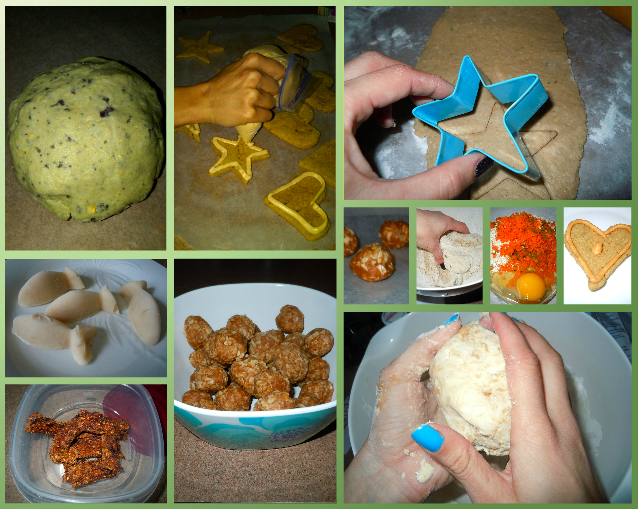 Tasty, wheat-free canine recipes for four-paw lickin’ treats! Much healthier than store-bought, these yummy recipes will have your dog begging for more tasty homemade creations! Recipes like Crunchy Turkey Treats and Apple Cinnamon Delights are unique and easy to make. This section includes wellness tips including beneficial supplements to add to your pet’s diet, skin and food allergy solutions and personal tips regarding pet health. Browse the articles below for personally reviewed solutions and pet health alerts. We know all about complicated pet surgeries and rehabilitation. In the past 6 months, we’ve had 3 rescue dogs who have undergone FHO surgery to repair broken, dislocated legs as well as a smashed pelvis and we’ve learned a great deal about the whole process. Browse to learn more about surgery and rehabilitation for dogs with injuries and learn how to raise funds for pets in need!